In an equilateral triangle ABC a point P is found such that AP = 3, BP = 4, and CP = 5. Find the side of ΔABC. The problem resembles one in a square, where a point was joined to three vertices of the square with segments of lengths 3, 4, and 5. In addition, there had to be significance to the lengths being the sides of the 3-4-5 triangle. The applet below illustrates the solution. Rotate ΔABC 60° around each of its vertices, all in the same direction. This will produce and equilateral triangle consisting of 4 copies of ΔABC, with three images of point P: Pa, Pb, Pc. The area of hexagon APcBPaCPb can be evaluated in two ways. 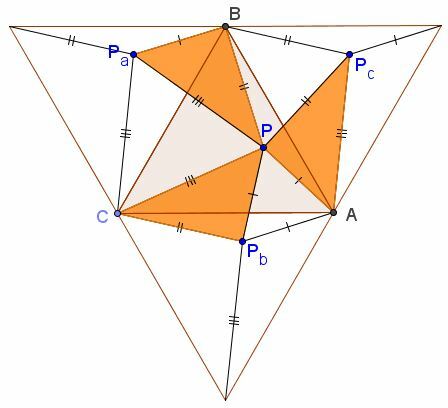 First, note that the complement of the hexagon in the big triangle consists of copies of triangles ABP, BCP, and CAP, each appearing twice. It follows that Area(APcBPaCPb) = 2 Area( ΔABC). a² = (25 √3/4 + 9) 4 / √3.